The best way to get into the holiday spirit in the Dallas-Fort Worth (DFW) area is to dress to impress and check out DFW's fantastic holiday events. Here are some festive plays, concerts, musicals, and shows that offer something for everyone. You can enjoy the traditional Nutcracker Ballet, a Christmas pops concert, tree lighting ceremonies, theater performances, and big-name entertainment. The Dallas-Fort Worth area is aglow with fun at holiday time. 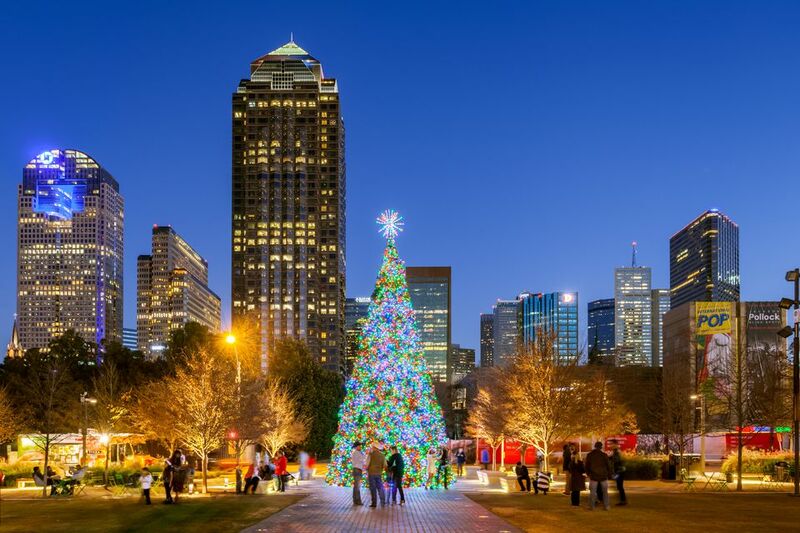 Celebrate the holiday spirit at Klyde Warren Park for Nissan's Winter Wonderlights Holiday Show and Tree Lighting. Enjoy big band classics, face painting, crafts, letters to Santa and more. The event takes place Saturday, Dec 1, 2018, from 2:00 p.m. - 6:00 p.m. at the Ginsburg Family Great Lawn. The celebration culminates with a holiday show at 5:30 p.m. and the lighting of the tree at 6 p.m. The Bass Performance Hall's line-up for the holidays includes "Handel's Messiah," "A Charlie Brown Christmas," and Mannheim Steamroller Christmas music. Built entirely with private funds, the Bass Performance Hall is the permanent home to the Fort Worth Symphony Orchestra, Texas Ballet Theater, Fort Worth Opera, and the Van Cliburn International Piano Competition and Cliburn Concerts. December events at the downtown performing arts complex are full of holiday cheer. Dallas Theater presents "A Christmas Carol," the Texas Ballet Theater presents "The Nutcracker," and at the Winspear Opera House, you can see Clint Black in concert with a Christmas-themed show. There are also weekend matinees featuring holiday entertainment. Casa Mañana Theatre in Fort Worth presents "Santaland Diaries," described as a sardonic, irreverent holiday tale of Crumpet, the grumpiest elf at Macy’s in New York at Christmastime. Performances will be December 6, 2018, through December 22. This show is suitable for those who prefer their eggnog spiked (mature audiences). Visit the Pocket Sandwich Theatre in Dallas for a collection of Christmas entertainment. This is a live theatre with optional food and beverage, deli-style fare, the last of dinner theaters in DFW. One performance, "Ebenezer Scrooge," is a tale of love and redemption, guaranteed to put you and yours in the spirit of the holidays, the theater's website notes. You'll also see on the calendar, "Harry Potter Christmas Celebration Trivia," and the "Levee Singers Christmas." Also being performed is The Snowy Day and Other Stories by Ezra Jack Keats on December 8, 2018, through January 20, 2019. Follow Peter and his friends as they enjoy the excitement of a fresh snowfall, the delight of whistling for the first time, the awe in finding a special treasure, and the feelings of a first crush. Packed with humor and fun, this production combines innovative shadow puppetry and live action to showcase Keats' appreciation for diversity. (No performances between December 24 and January 3). Recommended for ages 3 and up. The Dallas Symphony Orchestra, conducted by Andrew Grams, will present Tchaikovsky - Nutcracker and Sleeping Beauty. The concert takes place November 23 - 25, 2018 at the Meyerson Symphony Center. Two of Tchaikovsky’s grandest ballet scores kick off the holiday season. Plus, pianist Andrew von Oeyen performs Grieg’s much-loved concerto. On November 17, 2018 head for downtown Fort Worth for the annual Sundance Square Christmas Tree Lighting. The festivities start at 6:30 p.m. The beautiful, live, 59-foot tall Christmas tree will come aglow. Enjoy the holiday decor sparkle and shine. Sing along to holiday carols and enjoy a hot chocolate before a visit with Saint Nick, himself! The Dallas Symphony Orchestra presents their annual Christmas Pops Concert on December 7 - 16, 2018. The beloved tradition returns with Christmas classics, sing-along carols, the Dallas Symphony Chorus and the magnificence of the Meyerson Symphony Center decked out in her holiday finest.